A complete listing of the Milwaukee Brewers’ 2018 MLB draft picks with a capsule summary of each. Round 1, No. 21 — SS Brice Turang, Santiago (Calif.) HS: Hit .352 with a .464 on-base percentage, five home runs and 21 RBI as a senior. … Committed to play at LSU. … Ranked the 14th-best prospect by Baseball America and No. 25 by MLB.com. … Father, Brian, played for the Seattle Mariners. … Bats left-handed. Round 2, No. 60 — OF Joe Gray, Hattiesburg (Miss.) HS: Had a slash line of .491/.611/.905 with six home runs, 19 stolen bases and 36 RBI as a senior. … Also pitched and won five games as a senior and has been clocked as high as 98 mph. … Committed to play for Mississippi. … Ranked as 52nd-best prospect by Baseball America and No. 61 by MLB.com. Round 2 (comp. ), No. 73 — OF Micah Bello, Hilo (Hawaii) HS: As a senior, had a slash line of .564/.667/.821 with 16 stolen bases. … 2018 honorable mention selection by Rawlings-Perfect Game. … Ranked as No. 121 prospect by Baseball America and No. 171 by MLB.com. … Committed to play for St. Mary’s (Calif.). … Doesn’t turn 18 until July 21. Round 4, No. 125 — LHP Aaron Ashby, Crowder College: Was 11-2 with one save in 2018 with a 2.29 ERA in 2018. … Led all Division 1 JUCO pitchers in strikeouts (156) and K/9 (18.8). … Ranked as 106th-best prospect by Baseball America and No. 112 by MLB.com. … Drafted in 25th round by Texas in 2017. … Nephew of former major-league catcher Andy Ashby. Round 5, No. 155 — RHP Justin Jarvis, Lake Norman (N.C.) HS: As a senior was 8-2 with a 1.60 ERA. … Allowed just 33 hits with 95 strikeouts in 57 innings. … Threw a perfect game in his 2018 opener, striking out 18 of 21 batters. … Ranked as No. 120 prospect by Baseball America and No. 199 by MLB.com. … Committed to UNC Wilmington. … High school coach was former major leaguer Ty Wigginton. Round 6, No. 185 — RHP Drew Rasmussen, Oregon State: Hasn’t pitched since 2017, when he was 3-0 with a 1.00 ERA in 27 innings. … Threw a perfect game as a freshman in 2015 and was named first-team all-Pac-12 that year. … Had Tommy John surgery in March 2016. .. Drafted by Tampa Bay in first round of 2017 (No. 31) but wasn’t signed after issues with his pre- and post-draft MRIs. … Rasmussen wanted MLB to declare him a free agent, but the league did not accommodate. … Had Tommy John surgery again in September 2017 and missed the entire 2018 season. … The 173rd-ranked prospect by Baseball America and No. 200 by MLB.com. Round 7, No. 215 — C David Fry, Northwestern State: Batted .327/.440/.604 with 26 doubles, 12 home runs and 55 RBI in 2018. … Northwestern State’s all-time leader in doubles (74) and total bases (430). 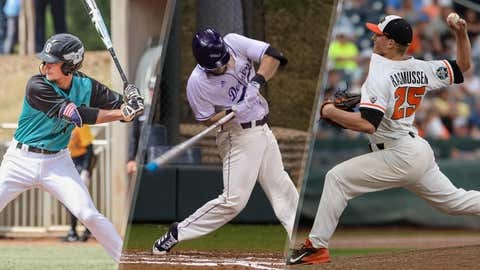 … Named third-team All-American by Collegiate Baseball Magazine and Southland Conference player of the year as a senior. … Also named Southland Conference tournament MVP in 2018. Round 9, No. 275 — CF Arbert Cipion, Passaic County Technical Institute: Had a .404 batting average with 11 stolen bases in 16 games before his season was cut short due to injury in 2017. … Signed to play at Southern New Hampshire University. Round 10, No. 305 — RHP J.T. Hintzen, Florida Southern College: In senior year was 14-0 with two saves, posting a 1.96 ERA with 114 strikeouts and only 13 walks in 96.2 innings. … Named a Division II first-team All-American. … Pitched in Cape Cod League in 2017 and had a 1.95 ERA over 23 innings. Round 11, No. 335 — RHP Davis Daniel, Auburn: As a sophomore in 2018, appeared in 17 games for the Tigers with 10 starts. … Posted a 3-4 record with a 5.25 ERA, .294 OBA and 60 strikeouts in 58.1 innings. … As a freshman tossed 70.1 innings with a 5.89 ERA and .273 OBA. Round 12, No. 365 — 3B Kyle Datres, North Carolina: As a junior in 2018, had a slash line of .343/.438/.504. … Had 15 doubles, three home runs, 62 runs and 34 RBI. … Named first-team All-ACC. … Hit .265/.391/.422 with seven HR as a sophomore. Round 13, No. 395 — RHP Reese Olson, North Hall (Ga.) HS: Stands 6-1, 155. … Committed to play for Georgia Tech. … 2018 Rawlings-Perfect Game honorable mention All-American. Round 14, No. 424 — OF Elijah Cabell, TNXL (Fla.) Academy: 2018 Rawlings-Perfect Game first-team All-American. … 70th-ranked prospect by Baseball American and No. 101 by MLB.com. … Known for his power stroke, he hit a home run off the statue in center field at Marlins Park as a junior in high school. … Committed to play for LSU. Round 15, No. 455 — RHP Nick Trogrlic-Iverson, Central Arizona College: In 13 starts posted an 8-3 record with a 2.35 ERA. … Had 91 strikeouts in 76.2 innings. … Signed to pitch for Georgia. Round 16, No. 484 — RHP Alec Barger, Polk State College: Pitched in 17 games with 16 starts. … Was 7-3 with a 3.56 ERA, .241 OBA and 86 strikeouts in 83.1 innings. … Previously pitched for Northern Illinois. … Committed to North Carolina State. Round 17, No. 515 — LHP Clayton Andrews, Long Beach State: In only season at Long Beach State, started 15 games and was 7-7 with a 1.99 ERA, .215 OBA and 118 strikeouts with only 17 walks in 99.2 innings. … Also played outfield and hit .302 with a .382 on-base percentage. … Named first-team All-Big West as a starting pitcher. … Played two years at Cabrillo College. Round 18, No. 545 — LHP Scott Sunitsch, Washington State: Made 14 starts in senior year, posting a 6-4 record with a 3.74 ERA and .267 OBA. … Pitched at least 33.2 innings in all four years with the Cougars with a high of 84.1 in 2018. … Had first nine-inning no-hitter by one pitcher for Washington State since 1976 when he beat Oregon on April 8. Round 19, No. 575 — RHP Peyton Zabel, T.F. Riggs (S.D). HS: Listed at 6-6, 220. … South Dakota’s Class A baseball player of the year. … In 38 innings pitched as a senior had a 0.18 ERA and 79 strikeouts. … Also hit .368. … Committed to Augustana for both baseball and football. … Was named South Dakota’s football player of the year and Class AA basketball player of the year. Round 20, No. 605 — RHP Joey Matulovich, California: As a junior in 2018 appeared in 19 games with five starts. … Had a 3.47 ERA and .233 OBA. … Made 12 starts among 17 appearances as a sophomore, posting a 4.76 ERA. … Freshman year pitched in 21 games with two starts and had a 2.49 ERA and .221 OBA. Round 21, No. 635 — LHP Steven Hajjar, Central Catholic (Mass.) HS: Gatorade player of the year for Massachusetts. … In 27 innings allowed 12 hits, with a 0.26 ERA and 41 strikeouts. … Ranked as No. 195 prospect by MLB.com and No. 201 by Baseball America. … Committed to Michigan. Round 22, No. 665 — LHP Joe Baran, Lackawanna College: Named Division II regional pitcher of the year. … Ranked fifth in Division II In ERA (1.55). … Had a .201 OBA while walking nine and striking ouf 52 in 40.2 innings. … Committed to Penn State. Round 23, No. 695 — RHP Jared Platero, Beckman (Calif.) HS: Served as Beckman’s closer. … Doesn’t turn 18 until November. … Signed with Long Beach State. Round 24, No. 725 — RHP Wade Beasley, Horatio, Ark. (Home school): Named all-state in 2018. … Committed to Arkansas. Round 25, No. 755 — LHP Pablo Garabitos, Lakewood Ranch (Fla.) HS: In 13 games as a senior he went 11-1 with a 0.50 ERA and 0.81 WHIP. … Struck out 103 and walked 16 in 83.2 innings. … Also batted .406/.491/.500 as a senior. … Named area player of the year in 2017. Round 26, No. 785 — RHP Connor Sparks, Marion M. Graham Collegiate (Saskatoon) HS: Helped lead Saskatchewan to its first baseball gold medal in the Canada Games. … Committed to Sacramento State. Round 27, No. 815 — RHP Brady Schanuel, Iowa: In his first year with the Hawkeyes, the junior was 5-7 with a 5.97 ERA and .246 OBA with 43 walks and 65 strikeouts in 53 innings. … Selected in 20th round of 2017 draft by Philadelphia. … Also taken in 36th round of 2016 draft by Oakland. … Pitched his first two years at Parkland College where he was a two-time NJCAA All-American. … In 2017, he was 10-3 with a 1.80 ERA and led Division II JUCO with 131 strikeouts, including 21 in one game. Round 28, No. 845 — C Kekai Rios, Hawaii: As a junior in 2018, hit .270 with a .383 on-base percentage. … Named first-team all-Big West. … Three-year starter at Hawaii. … Ranked as the 435th-best prospect by Baseball America. Round 29, No. 875 — SS Nander De Sedas, Montverde (Fla.) Academy: As a senior, batted .385 with a .531 on-base percentage. … The 28th-ranked prospect by Baseball America and No. 55 by MLB.com … Rawlings-Perfect Game All-American. … Under Armour All-American. … Went to same high school as Cleveland’s Francisco Lindor. … Like Lindor, is a switch-hitter. … Moved from third base to shortstop. … Committed to Florida State and has said he will not sign with the Brewers and will head to college.. Round 30, No. 905 — LHP Basilio Pacheco, Segerstrom (Calif.) HS: Golden West League MVP as a junior. .. Committed to Long Beach State. Round 31, No. 935 — LHP Matt Dillard, St. Pius X (Texas) HS: Named first-team all-district. .. Also played outfield and infield. … Committed to Sam Houston State. Round 32, No. 965 — UT Jonathan Cuevas, Palm Desert (Calif.) HS: Played third base and pitched. … Ranked the 485th-best prospect by Baseball America. … Committed to USC. Round 33, No. 995 — 1B Brandon Hylton, Ridge (N.J.) HS: As a senior batted .328 with three home runs and a team-high 16 stolen bases. … In 88 plate appearances was walked 20 times. … Hit seven home runs as a junior at Watchung HS. … Committed to Stetson. Round 34, No. 1025 — LHP Michael Mediavilla, Miami (Fla.): Moved to bullpen as a senior. … Had a 7.52 ERA and .315 OBA in 26.1 innings in 2018. … In 2016, made 18 starts and was 11-2 with a 3.40 ERA and .233 OBA, … Named second-team All-America and third-team all-ACC as a sophomore. Round 35, No. 1055 — OF Josh Watson, TCU: Batted .305/.437/.495 in 2018 as a junior. … Had 10 doubles, three triples, eight home runs and eight stolen bases. Round 36, No. 1085 — LHP Brandon Williamson, North Iowa Area CC: Made 12 starts as a sophomore in 2018 going 8-4 with a 3.14 ERA. … Had 104 strikeouts in 66 innings (14.18 per 9). … First-team all-NJCAA Region XI selection. … Committed to Michigan State. Round 37, No. 1115 — RHP Franklin Hernandez, Central Florida: Pitched 14 games in 2018 with four starts. … Was 3-1 with three saves. … Had an ERA of 1.96 and 44 strikeouts in 44.1 innings. Round 38, No. 1145 — RHP Aidan Maldonado, Rosemount (Minn.) HS: Ranked as 287th-best prospect by Baseball America. … Rawlings-Perfect Game honorable mention All-American. … Committed to Illinis. Round 39, No. 1175 — C Caleb Marquez, Blue Springs (Mo.) HS: Also was being recruited in football as a tight end. … Committed to play baseball at Barton Community College. Round 40, No. 1205 — C Wes Clarke, Liberty Christian (Va.) Academy: Rawlings=Perfect Game honorable mention All-American. … Hit .390 as a junior. … Committed to South Carolina.